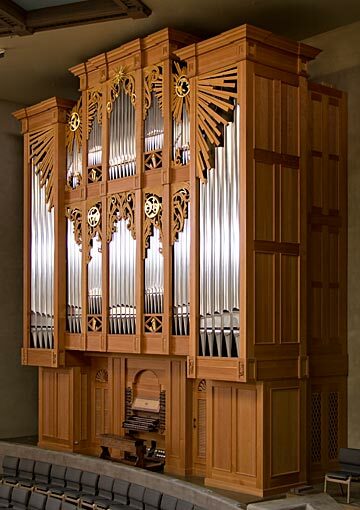 This project started in June of 1999 after then Pinnacle organist, Bob Clark, played the dedicatory recital of our opus 7 (Westminster Presbyterian, Knoxville, TN.) 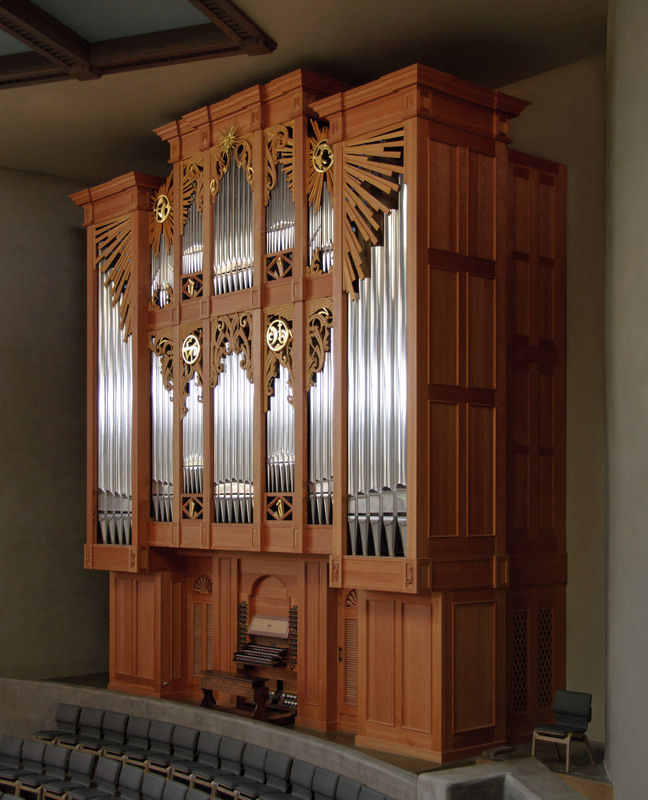 Shortly thereafter, we were asked to propose a new organ for Pinnacle Presbyterian Church. The new sanctuary of this church on the northern edge of Phoenix, AZ was already designed but not built. This large, modified amphitheatre style worship space is carved into the desert floor. Current organist and Director of Music, Brent Hylton, oversees 10 singing and ringing ensembles as well as a thriving concert series, and coordinates the use of the sanctuary as a second home to the Phoenix symphony. Though the stoplist and sound of this organ are representative of our larger three manual organs, the visual concept of this organ is unique in our work so far. The congregation and community have a strong commitment to environment and regional art and design. We used a rectilinear case of waxed douglas fir infused with elements of native Hopi art arranged in a classical aesthetic to blend this organ case into its non-traditional surroundings.